At Ohio State, Boston was head and shoulders above the competition. He set school records as a receiver, and his 1998 was among the best single season marks in Buckeye history (85 catches, 1435 yards and 13 TDs. After 3 years at Ohio State, Boston decided to declare for the 1999 NFL draft. The 1999 draft was pretty star studded. 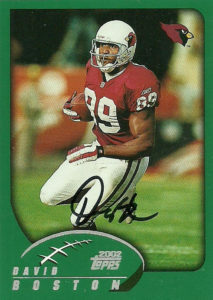 David was the second receiver taken off the board overall (behind Torry Holt) with the 8th pick overall by the Arizona Cardinals. Arizona couldn’t match San Diego’s offer to David Boston- who had become so lean and mean looking, he should’ve been playing tight end or linebacker instead of wide receiver. The guy was a walking 8 pack with 21-inch biceps! The Chargers deal was a mega contract at $47 million over 7 years. Who knows why things didn’t workout in San Diego, but the Chargers jettisoned him just after one season (70 catches for 900 yards, and 7 TDs) in 2003. It has been rumored that the Chargers didn’t like David’s work ethic or his attitude- but regardless, he was traded to the Dolphins in 2004, in the midst of a spate of legal issues. Boston was ready for a clean start in Miami, but then was suspended for 4 games because of steroids, and soon thereafter he tore some knee ligaments ending his season. He returned to play briefly in 2005, but tore his knee ligaments again. In 2006 he joined the Buccaneers, however before the season began he was arrested for a DUI and GHB. Tampa quickly cut him. David attempted to resurrect his career in 2008 in the CFL with the Toronto Argonauts, but a stress fracture in his foot ended his career after just one game. Lance hit up a boat show from what I remember and David Boston along with a few other random players were at this event. I had always wanted Boston on a card or two. His history as a physical specimen and his subsequent burnout of the league has always fascinated me.